This article originally appeared in the March 8, 2013 edition of Collegiate Baseball. PHILADELPHIA — Andy Gonzalez of Misericordia University is lucky to be alive. On Feb. 27, 2012, he was driving back to school from Philadelphia when another driver ran a red light and crashed into the passenger side of his vehicle. Andy started through the intersection after his light turned green, and he never saw the other car coming as the impact spun his vehicle around several times until it came to rest near a sidewalk. Gonzalez said that he felt some pain in his neck initially after the accident. But it wasn’t unbearable pain. “I had no idea how seriously hurt I was. I attempted to get out of the car, but the way the car was crushed in from the passenger side, the center console pinned one of my legs in. And my foot was stuck. I was able to get my foot and leg out, and they weren’t mangled up. While I was trying to get free, a witness who saw the accident came over and told me to stop moving and stay there. “The witness called 911. Once the ambulance arrived in about 10 minutes, paramedics carefully took me out of the car and protected my neck as they put me on a stretcher. “I was taken to Hammond Hospital in Philadelphia. When I regained consciousness, my clothes had already been cut off, and I was about to be put in a tube which I believe was CAT scan machine to take a closer look at my neck. As I woke up, I felt intense pain in my neck which at this point had a neck brace on it. The nurse told me I was at the hospital and had been in a car accident. She told me to stay still because they were running some scans on the neck area. Initially, he had some temporary loss of feeling in his feet. But Gonzalez could still move them. He was fortunate not to have any paralysis. “I then was wheeled to the Intensive Care Unit, and about an hour later, a doctor came in and explained that I didn’t have any internal bleeding. But he said I had an unstable break in my C-2 vertebra. The doctor told me that I was lucky to be alive and said it was rare for a person to break his C-2 vertebra and still be alive. The doctor said the unstable condition of the vertebra had to be taken care of as soon as possible and explained two options. “The first was a neck fusion procedure while the second was wearing a halo brace which would keep my head immobile while the C-2 vertebra healed over a long period of time. “He felt that I was young enough that the bone could heal by itself, and the halo brace was recommended by him. That’s when I had to figure everything out quickly. I told him that he was the expert with situations like this and gave him the go ahead to put the halo brace on. Then they brought me the paperwork, and I signed everything. “As soon as the team of doctors was ready, I was wheeled in as they fitted me for a halo brace. It was a very quick turnaround. A hard, plastic vest is put over your chest and torso starting above your belly button area. Connected to the vest are four bars which go up along the side of your head. The bars connect into a metal circular brace that looks like a halo and goes around your head. Gonzalez was asked if he could sleep at night with this unwieldy halo brace now attached to his upper body. “While I was in the hospital, I couldn’t move the main part of my body from the waist up. The only way I could move my upper body was by my lower body since the upper part was immobile. The hospital bed allowed the back part of the bed to go up and down. Sleeping was uncomfortable. And in the beginning, it was very painful to lie on the actual metal cage of the halo. I couldn’t lay on my head…only the bars. But this type of bed did help lower and raise my upper body. Gonzalez had been an athlete his entire life, and he was asked if it was difficult to be immobile. Gonzalez was in the Intensive Care Unit for three days and subsequently moved to general care in the hospital for another eight days. Then he was released to go back home which presented another challenge for him. “I wanted to walk out of the hospital because I had been lying in bed for so long. So they allowed me to use a walker even though I still wasn’t able to walk all that well. But I made it to our car. Before he left to go home, Gonzalez was told by the specialist at the hospital that he would never play baseball again. At that moment, the memory of his 2011 season was a distant mirage as he played in 38 games, started 35, and was named second team All-Conference as a catcher. “The doctor told me that this was a pretty serious break, and I would be able to walk. But as far as my competitive athletic career, that was a thing of the past. He told me that I wouldn’t be able to do those types of things any more. I listened to what he had to say. But I didn’t for one minute believe it. I refused to believe this. After I got home, I saw another specialist for a second opinion. After hearing the unsettling news from another specialist, he was depressed at first. But he knew deep inside that he would play baseball again. So he did everything he could to help his cause by searching the internet for products that might speed the recovery of his C-2 vertebra. “I simply couldn’t do much while I was in the halo for 12 weeks and another 10 weeks in a typical neck brace. There was no way I could train since I was pretty much immobile. All I could do physically was walk around during this period. But what I did do was stay positive which was the most important thing. Gonzalez said that the doctor requested that he not go back to Misericordia University during the spring of 2012 after the accident so he could heal properly at home. 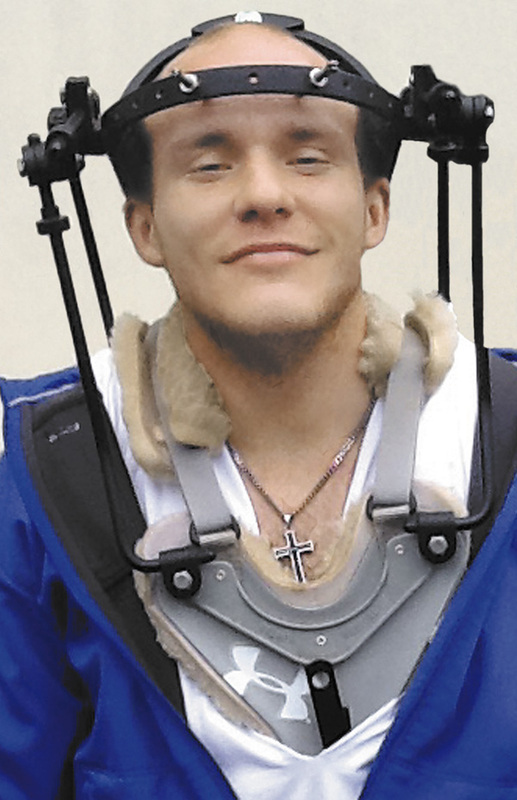 He felt it would be extremely difficult to attend classes and get around with a halo brace on. Gonzalez refused to allow his baseball career to end this way and told Coach Egbert that he was coming back in the fall of 2012 to play one final season for Misericordia. He planned on taking Informa-tion Technology Organization Management as a graduate student in the quest to obtain his Master’s Degree. “At the end of last season, Coach Egbert met with me and was probably very skeptical about me coming back. After all, I had a broken neck. He also realized that specialists had told me I would not be able to play baseball and other competitive sports again. “Before the injury, I weighed about 210 pounds. But after inactivity for so long, my weight plummeted to 180 pounds as I lost about 30 pounds. My muscle mass had really gone down. I went home for the summer and couldn’t really do anything. Once I got the halo brace off after 12 weeks, then I had to deal with the regular neck brace for 10 additional weeks. With that type of neck brace, I could do light stationary bike riding. “I also walk a lot which helped. In early August, I went to see the specialist for a checkup. An MRI of my neck was taken, and the specialist carefully looked at the images over and over again. Then he told me that he thought I would be able to play again because everything in the C-2 vertebra had healed well. So he wanted me to take everything slow and steady and cleared me for limited activity. My parents (Alison and Manny) were with me, and everybody had huge smiles on their faces. “You can’t imagine the tough road I had to get back to this stage. And I wouldn’t have made it this far without the help of my parents, support of Coach Egbert and all the guys on the team. I realized at that moment that I could start preparing to be a baseball player again. Fall baseball practices were going to start in a month. And I hadn’t done anything with baseball for the previous seven months. Gonzalez said that the specialist wanted him to come back to the office in a few weeks to be cleared for full activity at the tail end of August. “When I was given the first clearance, all I was allowed to do was very, very light weight training. Nothing overhead was allowed. I could run and jog and do cardio work. It was important to take it easy and not have anything bad happen. I went back to the doctor several weeks later, and he cleared me for full baseball activity. Then I started running every day and did as much lifting as I could to build up my strength. I tried to throw and hit, but it was out of the question because my neck was so stiff. “Before the injury, I had taken baseball for granted. It was just a joy being out there throwing, hitting and being a catcher. I found out a year ago that all that can be taken away. As soon as I was cleared, I rededicated myself to the game I love. And every day, I would wake up and think about the days I couldn’t weight train, run or play baseball and could only be in bed with the halo brace on day after day for 12 weeks. It was an incredible motivator for me. All I wanted to do was work out, run, throw and hit. Once I was able to really do those things, I got after it. Gonzalez said that after he was able to have more range of motion with his neck due to hours of physical therapy, then he was able to throw, hit and catch with more precision. “I caught my first bullpen in mid-September in a practice situation, and it felt incredible. It was the greatest feeling in the world. And then I started throwing and hitting more. Now I am ready to play in 2013. “It is amazing how far I have come when you look back on this journey from having a broken neck. In 2011, I was the starting catcher and helped our team win its first conference title. Then last year, all I could do was sit on the bench and cheer them on. I wouldn’t be here now without the support of my parents, coaches and all the guys on the team. They have all been wonderful. I will never forget my head coach traveling two hours to see me the day of the accident as he dropped everything he was doing. That meant a lot to me. From the time I was told I would never play baseball again to me telling Coach Egbert I would play again, he has been there checking up on me to make sure I was OK.
Misericordia’s Egbert brushed off the notion that he was special for visiting Gonzalez in a hospital two hours away on a moment’s notice. “It was the right thing to do, and I would like to think a number of other coaches would do the same thing,” said Egbert. “Andy’s friend in Philadelphia called to inform me about the accident. She notified me that he was in the hospital and was in no condition to speak right away. “That news really threw me for a loop. As a coach, you are shaken up. Andy had been in our program for four years, and I was very close to him. When you get those types of phone calls, it’s not easy to handle. “The other difficult thing about that is relaying the information to the team. But with today’s technology, a lot of them were aware of what happened before we were able to get together later that day. Egbert marveled at the strength and resolve it took by Gonzalez to make it all the way back to playing baseball again with the odds stacked against him. “It’s been a long, long journey. About 2/3rds of the way through the 2012 season, we had a Saturday home game in April, and Andy’s mom drove him to the game from Long Island to the field. We are in the outfield stretching for a conference doubleheader, and here comes Andy walking around the corner. The reaction was priceless. Everyone stopped and went over to see him and gave him a big hug. He was very inspirational to our team. “I tell him to this day that even though he wasn’t able to play in 2012, he was a very big part of the team. Doctors told him he would never be able to play baseball again and was lucky to be alive. “He refused to accept that and is back for his fifth year to get his Master’s. He made a lot of sacrifices physically, emotionally, mentally, academically and financially to do what he is doing. To me, it is a great story. He is healthy right now and ready to play. “Andy is actually stronger than before the car accident. He did a phenomenal job of getting back to full strength. He wants to prove to everybody else that he can come back better than he was. Hi I also broke my neck in a car accident. I fractured C1 C7 and other vetebraes in my back. I broke four ribs, and my wrist and had a closed head injury and an occipital fracture. I too have been in rehab for a long time. I was partially paralyzed, in a wheel chair. I am now walking on my own, trying to rebuild my strength and lose the weight that I have put on because of this accident. I still have limited range of motion in my neck. Which I am working on. This is a long and hard process. It’s probably the worst thing that I have ever had to conquer in my life. I too was athletic,and that is the only reason that I am here today, being able to tell you about my injuries. I was in a HALO so I know exactly what you went through. Good Luck in your recovery.